In the United States, the primary definition for the term “stay-at-home dad” comes from the U.S. Census Bureau. As the sole country-wide demographic agency, the Census Bureau is responsible for collecting data on households, children, and employment through the decennial Census. Since the concept of a stay-at-home dad is situational, but the Census data is uniform, the Bureau arbitrarily creates a specific definition for use in their popular Father’s Day press release. This narrow definition affects the calculation of the number of stay-at-home dads which is widely reported by mass media outlets. A man must meet all criteria included in the definition to be counted in the number of reported stay-at-home dads. Many stay-at-home dads are not included based on the narrow wording of the Census Bureau definition. Fathers who are not married are not included. This means stay-at-home dads who are widowers, separated, and divorced are not included. Stay-at-home dads who have children 15 or older are not included. Stay-at-home dads who self-report that they have actively looked for work within the past 56 weeks and were available to start a job are not included. This means stay-at-home dads actively looking for part-time employment or home-based employment are considered “in the labor force” and thus not counted in the Census Bureau data. Stay-at-home dads whose wives were “out of the labor force” for even one week out of the previous 52 weeks are not included. Stay-at-home dads whose wives were at home for even one week out of the previous 52 weeks for any reason (including retirement or disability) are not included. Families where both parents are out of the labor force are also excluded. The excluded families contain a fair number of high income married couples with kids where neither parent works. 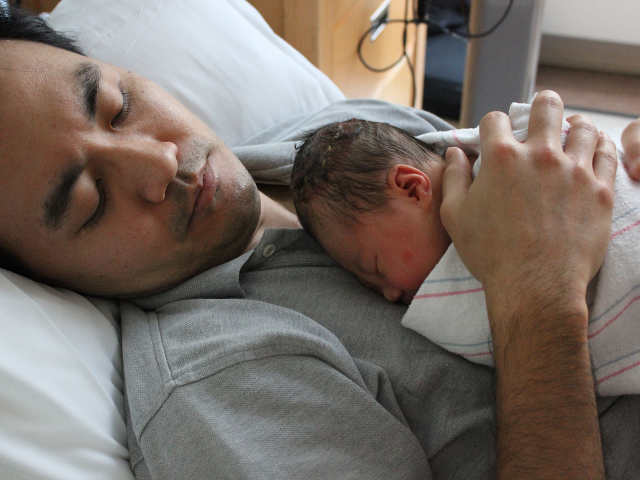 The picture below shows one definition of a stay-at-home dad: A father lucky enough to be able to hold his newborn baby just after her birth.